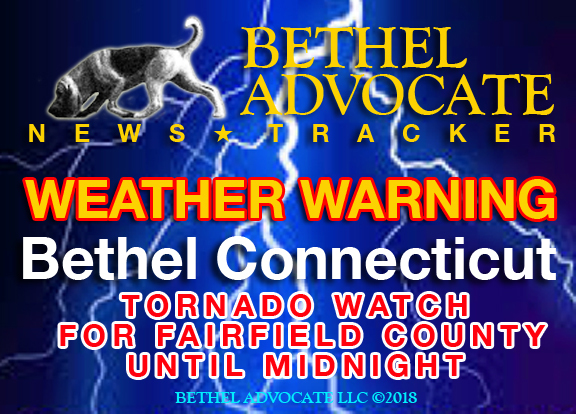 (5:15 PM EDT Tue Oct. 2, 2018) The National Weather Service reports a Tornado Watch in effect for Northern Fairfield County, Southern Fairfield County and Southern Westchester County until midnight tonight. This Hazardous Weather Outlook is for southern Connecticut and southeast New York. A cold front will approach the area this evening and pass through tonight. Showers and thunderstorms ahead of the cold front will bring strong winds and locally heavy rainfall mainly across northeast New Jersey, the Lower Hudson Valley and southern Connecticut. The cold front moves offshore late tonight bringing and end to the showers and thunderstorms. High pressure returns on Wednesday with unseasonably warm temperatures through Thursday. A STRONG THUNDERSTORM WILL AFFECT SOUTHERN FAIRFIELD AND CENTRAL WESTCHESTER COUNTIES. At 513 PM EDT, a strong thunderstorm was located near Bedford, or near New Canaan, moving east at 25 mph. Winds in excess of 40 mph and dime size hail are possible with this storm. Stamford, Norwalk, New Canaan, Fairfield, Greenwich, Trumbull, Westport, Ridgefield, Darien, Wilton, Weston, Redding, Bedford, Georgetown and Easton. A Tornado Watch remains in effect until midnight EDT for southern Connecticut…and southeastern New York. Showers and thunderstorms likely. Some of the storms could produce gusty winds and heavy rain. Cloudy, with a steady temperature around 69. South wind around 9 mph. Chance of precipitation is 60%. Showers and thunderstorms likely, mainly before 2am. Mostly cloudy, with a low around 64. South wind around 8 mph. Chance of precipitation is 70%. New rainfall amounts between a quarter and half of an inch possible. Mostly sunny, with a high near 73. North wind around 8 mph. Partly cloudy, with a low around 53. North wind around 5 mph becoming calm in the evening. A 30 percent chance of showers and thunderstorms, mainly after 4pm. Partly sunny, with a high near 77. Calm wind becoming southwest 5 to 8 mph in the morning.